The purpose of this article is to serve as a general strategy guide with tips and advice that you should follow when attempting to win a pasta eating challenge. There are many different varieties of pasta eating challenges all around the world, and they come in all shapes and sizes. Some challenges involve a large tray of macaroni and cheese, while some involve a large bowl of spaghetti and other noodles. Some involve meatballs and other meats while others just consist of noodles and sauce. A few pasta challenges include bread or breadsticks while others do not, and some pasta challenges consist of many different pasta dishes served on one platter. Even though there are many different variations that you may encounter, the basic strategy that you need to have remains similar for every variation. Before we go into the specific strategy details for winning a pasta eating challenge, please make sure you have read and understand our Basic Strategy For Winning A Food Challenge article. That article is full of 14 different basic strategy tips that will not be included in this article, which you also need to understand before attempting a pasta challenge. Please start off by watching our very informative How To Win A Pasta Challenge video so that you can visually see all of our different tips put into practice during an actual pasta eating challenge. For this video, I attempted Mama’s Hill Of Spaghetti Challenge at Mama Campisi’s Italian Restaurant in St Louis, Missouri. 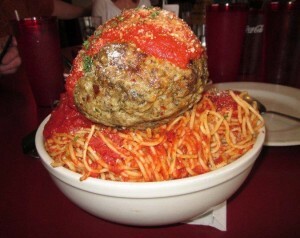 During this challenge, I had to finish 4 pounds of spaghetti along with a massive 2 pound meatball. The 6 pound meal had to be finished in one sitting to get it free along with a t-shirt. This is one of the few awarded free without a specific time limit. 1. The extreme amount of pasta noodles is the main component – When facing burgers, hot dogs, sandwiches, steaks, and other “meaty” challenges, the main component that makes up a majority of the total challenge weight is the meat. With pasta challenges though, the meat typically only makes up a very small portion of the challenge weight. Pasta challenges are called “pasta challenges” because they primarily consist of eating a massive amount of pasta noodles covered with sauce. Some include meat(s) and some do not, depending mostly on the type of pasta being served with the challenge. You are not likely to see meat served with macaroni and cheese. Regardless of types and percentages though, the main component you need to focus on during a pasta challenge is eating as much of the pasta as you can before it begins to cool down and get tougher to consume. 2. Use large utensils to take bigger bites and eat the pasta faster – The easiest and most effective way to consume the pasta as fast as possible is to use large eating utensils. I always bring a large “serving spoon” and “serving fork” to every challenge that I attempt, just in case I need them. You may even want to bring your own large utensils too, because most restaurants won’t have any available for your personal use. Scoop or “fork” as much pasta as you can into your mouth so that you can quickly swallow and move on to the next set of bites. You will have a much easier time swallowing pasta because the noodles are covered in sauce which allows you to swallow much more easily than trying to swallow breads and other “dry” substances. If you use regular, small eating utensils, it will take you much longer with a lot more effort to eat the pasta, and remember that “time” is not your friend during large food challenges. As time goes on and the food cools down, the challenge only gets tougher, so use large utensils to help you finish the meal quickly and successfully complete the challenge. 3. If it is just one large bowl, break the pasta down into 2 halves – If your challenge is similar to the one in our video and consists of a large bowl that is overflowing with pasta, it would be a smart strategic move to divide everything into halves. You will be able to get a better understanding of “where you are at” during the entire challenge. If you just start from the top and work your way down, you will never really know how much is left compared to what you started with, and you may eventually start to feel like the “hill” of pasta is never going to end, or that the pasta keeps continually regenerating. This feeling is very disheartening and can lead to failing the challenge if you are not careful. Divide the pasta up into equal halves so that once you finish half, you know you are already halfway done!! This will be much easier on your mind. If your macaroni or lasagna challenge is served in a flat tray, this strategy step really doesn’t apply. You just need to start on one side and work your way to the other, or you can also start in the middle & work your way out. It just depends on your preference. 4. Like other challenges, eat some of the meat(s) first if possible – About 50% of pasta eating challenges involve meat and the other half of them do not. Some of those challenges are served with the meat(s) separated from the pasta (usually on top), and some are served altogether with the pieces of meat mixed in with the pasta. If the meat is served separated from the pasta, it would be smart to eat at least half of the meat very early on in the challenge, if not before you even begin eating the pasta. Yes the pasta is the main component, but meat is heavier and more dense than pasta noodles, so you should still focus on eating most of the meat first while it is warm and juicy. There typically is not much meat included with pasta challenges, so it won’t take that long to finish 1/2 or 2/3 of the meat anyway. Make sure to save some for later though to eat with the pasta once you begin getting tired of the flavor from the noodles and sauce. If the meat is already mixed in, then you will just have to eat the meats and noodles altogether throughout the entire challenge. If your challenge doesn’t involve any meat, obviously this step does not apply. Without any meat, you will need liquids to battle flavor fatigue. 5. Try to keep the pasta warm so that it never fully cools down – It is not easy to eat four to five pounds of warm noodles, but it is even tougher to eat pasta when every bite is cold and bland. When your pasta meal is served to you, it will most likely be steaming hot, but that warm and delicious food will turn cold and tasteless if you take too long to eat it. It will become cold even faster though if you mix it up, spread it out, and allow all the interior heat to escape. If you separate your pasta into two halves, scoop off the top half and don’t touch the bottom half, keeping all of the heat in so that your 2nd half is still warm when you get done with the first half. Like I did in the video, take the top half and separate it on to a large plate while keeping the remaining half inside the original bowl to stay warm and flavorful. If your pasta is served in a flat serving tray, start from one side and work your way to the other or start in the middle and work your way out. Do NOT just mix everything up because that allows all of the heat to escape and all your food will begin cooling down. Keep the sections you are not immediately eating untouched so that any remaining heat is held in to keep your food warm until it becomes time for you to consume it. You’ll enjoy your meal much more and flavor fatigue will not be as rough later on. 6. Use the pasta sauce(s) to help you swallow rather than liquids – It is almost always recommended that you minimize consumption of excess drinks that are not required as part of the challenge so you don’t fill yourself up with liquids and then don’t have enough stomach space remaining to finish the last few bites of your meal. This especially applies to “dry” challenges like pancakes, burgers, sandwiches, and any challenges involving a large amount of bread. Almost all pasta challenges include a pretty heavy amount of “runny” sauce on the noodles which makes them slide down your throat much more easily without having to chew a lot or chase the food down with liquids. Especially early on in the challenge, don’t drink water and other liquids unless you really need to. While the sauce is hot, before it cools down and thickens up, use that pasta sauce to help swallow the food. Save your drinks for later on to help fight flavor fatigue once the sauce thickens and the taste weakens. 7. If necessary, divide the remaining 1/2 into equal halves again – If your challenge started with a “mountain” of pasta rather than just a “hill” and there is still a lot left even after you divided it into halves, split the remaining half into equal halves again. Keep using simple mind games to help ease your body and brain through the entire massive challenge. Once you finish that first remaining half, you will only have 1/4 of the challenge left. That isn’t too tough to finish is it?? Only 1/4 left!! For more information about this theory, check out Use Mind Games To Trick Yourself To Victory. This remaining pasta should still be pretty warm if you followed our tip #5 above. 8. If the challenge includes bread, start eating it when 2/3 done – Spaghetti and meatballs go together just like pasta and breadsticks, so you typically will find meatballs in spaghetti challenges, and you typically will find breadsticks or garlic bread with other pasta challenges. If you are required to finish bread too along with your pasta, it is recommended that you start incorporating it after you are 2/3 through finishing the challenge. It is easier to eat cold breadsticks than it is to eat cold pasta, and you typically want to focus on eating the bread towards the end anyway with every other challenge containing bread too. The texture of cold bread is not too different than warm bread. Wipe the excess sauce off your plate or dish with each breadstick and let that sauce help soften the bread so that it can be swallowed more easily without having to drink excess liquid. This will help enjoy the cooled down bread and the people watching you will also appreciate your sincere cleanliness. 9. If you start feeling full towards the end, stand up or kneel down – This tip pertains to all challenges and not just pasta eating challenges, but it made the video so I wanted to include it here in the article too. For more information about why standing and kneeling are helpful, read Sitting vs Standing vs Kneeling While Eating. 10. Please DO NOT use your hands to eat the saucy noodles and meats – I hope for our world’s sake that this tip did not really need to be included, but please do not use your hands to eat pasta, and use proper utensils. Most pasta challenges are hosted by fancier Italian restaurants which are typically much more formal than fast-food Italian themed places such as Fazoli’s. You may watch somebody eat noodles with their hands during a noodle eating contest, but using your hands during an actual pasta challenge would be extremely looked down upon. Everyone around you will be completely grossed out, and using your hands is not that much more effective than just using large utensils. Please practice Proper Food Challenge Dining Etiquette and eat your pasta quickly while still using civilized manners. You may still get pasta sauce on you and around your mouth because you are taking bigger bites with your large utensils, but napkins quickly solve that perfectly understandable problem. This is very rare and there are not many challenges like this, but a few pasta challenges involve many different smaller pasta dishes together as one large challenge. Mick & Angelo’s Man vs Food Italian Challenge includes soup, lasagna, spaghetti, meatballs, chicken parmigiana, manicotti, sausage, garlic bread, and even a red velvet cupcake. If you are attempting a challenge like this, follow basic challenge rules and eat the meats first before everything else while they are warm. Then eat the “tougher to eat” pastas next while you are still feeling well. Save the “easy to eat” dishes until the end to consume when you are not feeling as strong. If you know that a dish will be chewy, eat it early on so that you get the tough dishes out of the way and you can coast to an easy finish. Eat the bread towards the end and have the desserts last. Follow these rules and you will be successful. If you combine the tips above with the Basic Strategy Tips For Winning A Food Challenge, you have all the major advice and knowledge you need to plan the strategy you will use to dominate your next pasta eating challenge.